On arrival at Delhi Airport meet our representative, "Welcome" than drive to Pangot, on arrival check in at the hotel overnight stay at the hotel / resort. Morning after breakfast, walking trail or the bird walk. Through bird walk, will come closer to the Mother nature. The start point of bird walk is the Kilbury and another one is at Pangot. Post Lunch, you will be enrolled in bird walk at Baggar which runs from the local sylvan thicket.You will explore all the near by tourist spots in Pangot which will make your travel to Pangot an enthralling experience. Overnight stay at the hotel / resort. Morning after breakfast starts with bird trek to Bajun - Mongoli and the travelers enjoy a packed feast for lunch. Your trek will end at Mongoli. Towards the campsite halting on the route at Corbett Falls for exciting and rare sightings of forktails and Bharatpuri for Ibisbill. The day ends on a healthy keynote with a nice and satisfying dinner and an overnight stay at the base camp. Morning after breakfast, bird watching tour stint at Kumeria. than drive towards the Bijrani area for birding while on a jeep ride. 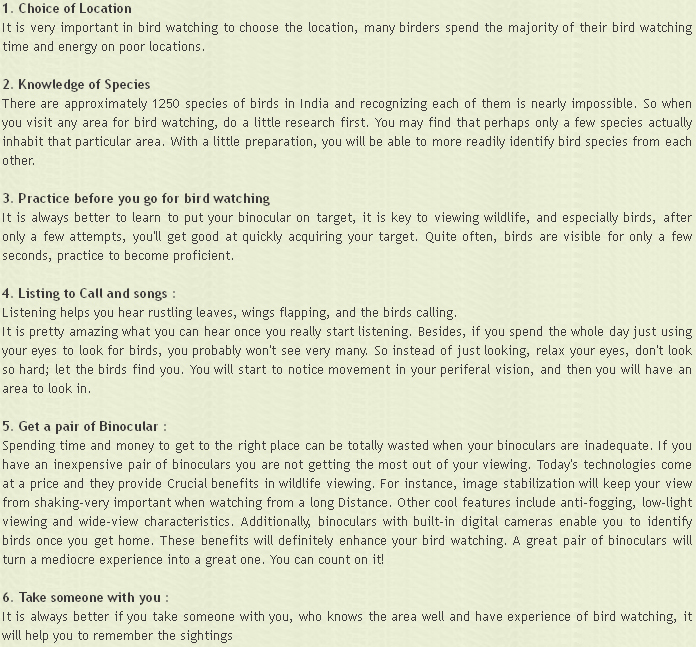 This bird watching tour will be a complete wildlife tour, overnight stay at the hotel. Morning after breakfast, birding in the park, evening transfer to the Ramnagar railway station, on arrival at Delhi railway station meet our representative than directly transfer to airport, time to catch the flight for onward destination. Corbett National Park Corbett falls, bird watching in Kumeria, Birding by Jeep ride in Bijrani area.